Our Abpromise guarantee covers the use of ab78432 in the following tested applications. Ab78432 is purified by affinity purification. Probably plays a role in facilitating the assembly of multimeric protein complexes inside the endoplasmic reticulum. Involved in the correct folding of proteins and degradation of misfolded proteins via its interaction with DNAJC10, probably to facilitate the release of DNAJC10 from its substrate. Endoplasmic reticulum lumen. Melanosome. Cytoplasm. Identified by mass spectrometry in melanosome fractions from stage I to stage IV. Publishing research using ab78432? Please let us know so that we can cite the reference in this datasheet. 	TMB stopping solution (1N H2SO4). 1. Add 100 µL of Rat anti-GRP78, 10µg/mL Mab (76-E6) (ab25192, Abcam) into each well in a high binding 96-well plate (Corner Notch, Thermo, 15041). 2. After adding 100 µL anti-GRP78 Mab, seal the plates and incubate overnight at 4°C. 3. Aspirate the anti-GRP 78 Mab antibodies out of the wells. 4. Wash each well with 200 µL of PBST (PBS + 0.05% Tween20) at 5 min x 3 times to remove unbounded anti-GRP78. 5. Add 200 µL 0.1% BSA (0.05g BSA in 50 mL PBS) to each well and incubate for 2 hrs at room temperature, or overnight at 4oC. 6. Remove the BSA and wash each well with 200 µL of PBST (PBS + 0.05% Tween20) at 5 min x 3 times to remove unbounded anti-GRP78. 7. Add samples (100 µL) that have been diluted 1:50 in PBS and GRP78 standard solution (100 µL) into each well in duplicates. 8. Incubate plate at 37 °C for 1.5 hrs on a shake and bake oven. 10. Add 100 µL of detecting Ab (rabbit polyclonal against GRP78, ab21685, abcam, 1:1,000), seal plate and incubate for 2 hours 37. 11. Remove the rabbit polyclonal anti-GRP78 (ab21685) via aspiration and wash plate for 5 min X 4 times with PBST. 12. 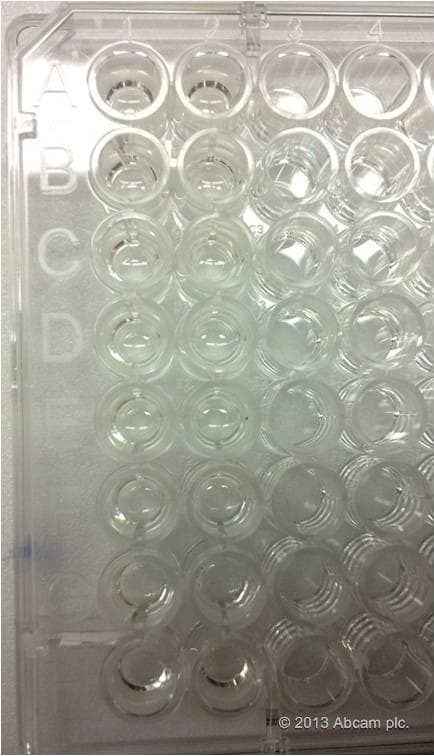 Add 100 µL of Secondary Ab (donkey anti rabbit-IgG-HRP, sc-2313, Santa Cruz, 1:8,000) into each well in the plate. 13. Seal plate and incubate at room temperature for 2hrs. 14. Discard Secondary Ab and wash plate for 5 min x 4 times with PBST. 15. Add the chromagen (100 µL of TMB (substrate) to the plate and incubate for15 min at 37 degrees Celsius (if blue color is too faint, increase incubation time). 16. Stop the reaction by adding 50 µL of 1N H2SO4 into each well and mix gently. 17. Check the absorbance at 450nm with Spectrophotometer. Results: absorbance was the same across all concentrations of GRP78 protein standard (including background). What grade/purity of ATP was used in the kit that was used to calulate the biological activity of the protein. The purity of ATP used in the kit used to calculate the biological activity of the protein was >99%. I believe my colleagues have already emailed you with the catalogue number of the Malachite Green assay that was used during the testing. With that said, any further details of the assay conditions used to test the recombinant GRP78 activity would be very helpful. I am planning to purchase this item and probably the kit as well for the purpose of conducting activity assays, and your working protocol seems like a great place to start for my own experiments. That actually helps a lot, to know that this particular assay kit (ab65622) was used to assess the ATPase activity of the recombinant GRP78 product (ab78432). Perhaps that information could be added to the product information for the GRP78? I apologize, however there was a misunderstanding. I did not know that you were asking for the malachite green based assay used for assessing the activity of ab78432. We do not knowwith which kitthe recombinant GRP78ab78432 activity has been tested. We have now asked the laboratory to receive these details and will update you on this. The ab65622 is the only malachite green based kit we have in our catalog currently - this is why I cited this product. Once again, please apologize for the confusion. We will write you again, as soon as we have more information. Thank you for your patience. Customer contacted us thet are concerned that the presence of 20mM Sodium phosphate in the buffer will interfere with any activity assay. This product has ATPase activity at the time of manufacture of 2.3µM phosphate liberated/hr/µg protein in a 200µl reaction at 37°C (pH7.5) in the presence of 20ul of 1mM ATP using a Malachite Green assay, was this prior to adding this buffer? They are concerned that as this is such a small volume how could they remove the sodium phosphate? 20mM Tris,50mM KCl,5mM MgCl2,1mM DTT, pH7.5. How long is the His tag on this product? Thank you for contacting us. The His tags for all four proteins you asked about are all 6X tags. I hope this information is helpful to you. Please do not hesitate to contact us if you need any more advice or information.